At MariaDB we often get to deal with tables, but this time we took on one of a different type, and climbed to the top. 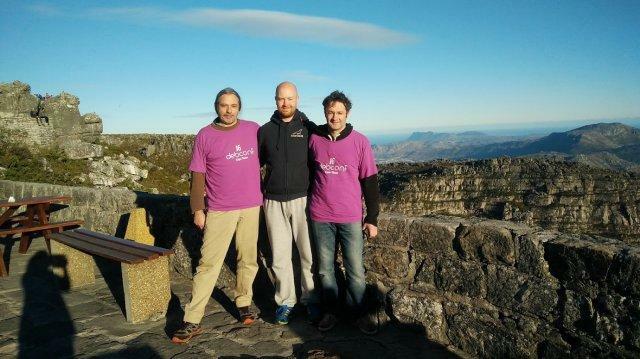 We’re in Cape Town for Debconf16, and managed to take some time to climb to the top of Table Mountain. It’s been a productive visit. Otto, who handles MariaDB packaging for Debian and Ubuntu, and is also CEO of the Foundation, hosted a BoF session on MariaDB and MySQL packaging. It’s an interesting time on the Debian packaging side, with some changes imminent, and it’s been great to see the interest and support. Otto also presented a talk on passwordless logins with the unix_socket plugin, an ideal solution for this running large infrastructures and dealing with password hell. Sergei is the MariaDB Corporation’s Chief Architect. It was touch and go, but luckily he didn’t fall off the mountain, so the upcoming 10.1.16 release is still on track. He also presented a talk on new features in 10.2, and the aim is to get MariaDB 10.2 into Debian Stretch. My primary focus is the documentation on the MariaDB Knowledge Base. One of the areas of documentation that could be improved is in the subtle (or not-so-subtle) differences in setups in different environments, and I’ve already come across a few Debian specialities that aren’t the case on other systems. We’re in Cape Town until Sunday (and I’m lucky enough to live here), so if you’re interested in MariaDB in any way and haven’t yet done so, please come and say hi.